Acton, Arlington, Bedford, Belmont, Boston, Brookline, Cambridge, Charlestown, Concord, Framingham, Hudson, Lexington, Lincoln, Maynard, Natick, Newton, Somerville, Southborough, Stow, Sudbury, Waban, Wayland, Wellesley, Westborough, Weston, and Winchester. You can browse our stops by town – if you scroll to the bottom of this page, you can see a link called “Catch the Bus From…”. If you click on it, you’ll see a list of towns – click on a town and you’ll see stop information for that town. Transportation is provided to towns based on interest. Please Note: If we do not have a stop available in your town and you choose to take the bus from a stop in a neighboring town, your bus charge will be discounted by 50%. 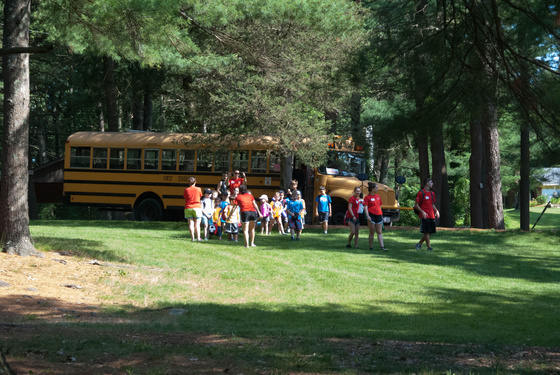 We hire Camp Sewataro counselors as monitors on each bus who make the bus ride an extension of the camp day with songs, games, and trivia. The bus monitors also get off the bus at each stop. In the morning, the monitor will greet you and your child at your stop and take attendance. In the afternoon, the monitor will get off the bus with your child and using information provided by you prior to camp, will make sure your child is picked up by the appropriate person. Seat belts on school buses are not required by the state of Massachusetts. Some of First Student’s buses may have seat belts, but some do not. There is no way to guarantee that any particular bus will have them. The transportation forms are now available to enrolled families in your online account. To access the bus application, log into your CampMinder account and fill out the “Transportation and Extended Day Options” form and indicate that you will take the bus. This form will prompt the bus application to now appear in your forms to fill out. Please call 978-443-3100 or email with any questions about this process.